Click the button below to add the Saeco Xelsis EVO Super-Automatic Espresso Machine to your wish list. Hate waking up in the morning, stumbling over to the espresso machine only to find your drink settings have been tampered with? Don’t let it happen again, with the Saeco Xelsis EVO super-automatic espresso machine. This updated version of Saeco’s original Xelsis espresso machine includes all of the same features boasted by the original, along with upgrades to the frothing system and drip tray. With its Multi-Function and Multi-User settings, the Xelsis EVO can be programmed to cater to the specific drink preferences of up to six different users. That means everyone in your household can create a personal profile and program their drink volume, temperature and strength settings for truly customized beverages on demand. 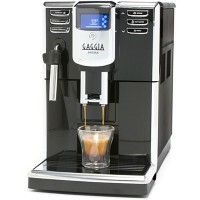 Not just a coffee machine, the Xelsis EVO features the same H2 Technology milk carafe used by the Exprelia EVO. This dual chambered milk carafe is capable of creating rich, creamy froth perfect for lattes, cappuccinos, and macchiatos. When you’re done frothing, any extra milk in the carafe can be stored in the fridge to ensure freshness.The carafe locks into the front of the machine for instant steaming and frothing. As with most high-end Saeco super-automatic machines, the Xelsis EVO comes equipped with a number of user-friendly features including: the Saeco Brewing and Aroma Systems, a ceramic disc grinder, removable water reservoir with Intenza filter, and automated cleaning cycles. 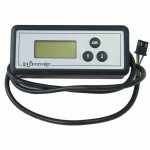 The Xelsis EVO also has a touch-screen interface that makes programming intuitive and hassle-free. 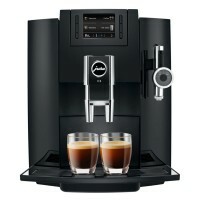 This turnkey espresso machine is great for the busy, modern household. The Xelsis Evo has a removable 54oz water tank with an Intenza water filter. Along with the bean hopper, the water tank is easily accessible from the top of the machine for hassle-free cleaning and refilling. This updated version of the Saeco Xelsis features the same H2 Technology milk carafe as their Exprelia Evo machine and a larger drip tray that you won’t have to empty as frequently. 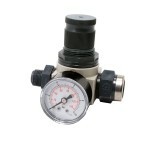 The brew group is accessible from the front and can be detached for easy rinsing and maintenance. 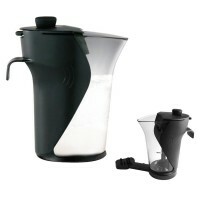 You can remove both the group and grounds container without disturbing the drip tray or milk carafe. Get hot water on demand for hot chocolate, tea, or even oatmeal. The water dispenser also doubles as a steam wand, allowing you to manually steam or froth your milk. The illuminated touch-panel is both easy-to-read and intuitive. The controls have one-touch functionality and icon-based displays help guide you through the drink selection process. The integrated heavy-duty ceramic disc grinder allows for precision grinding. The ceramic discs, or burrs, have the advantage of being more durable than their stainless steel counterparts; you’ll also be able to achieve a finer grind. 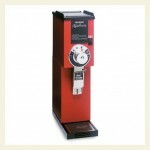 This remarkably quiet grinder has an automatic shut-off feature and the grind fineness can be easily adjusted by the user. In addition, the Xelsis Evo has a bean hopper, equipped with an airtight-sealed, anti-UV coated lid, to preserve your beans. 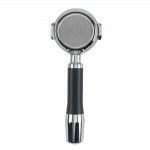 A bypass doser gives you the option of skipping grinder in favor of pre-ground coffee. The Saeco Xelsis Evo has an innovative milk management system that features a detachable carafe. The milk container can be removed and stored in the refrigerator for your convenience. Once the milk container is attached to the machine, the Xelsis Evo will steam or froth milk, according the beverage selected, and dispense the milk directly into your cup. 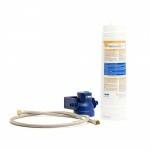 An automated rinse cycle helps to keep the machine clean and free of build-up. You also have the option of manually steaming your milk using the steam wand/hot water dispenser. Customize drink volume, strength, or temperature, and other preferences for up to six users with the Multi-Function and Multi-User Feature. The Xelsis Evo will remember every user profile and automatically activate the corresponding settings. The Xelsis Evo features the Saeco Aroma System, a programmable pre-infusion cycle that infuses hot water into the coffee to extract the full flavor and aroma of your grounds. You can adjust the Aroma System by turning it on, off, or prolonging the cycle. The Xelsis Evo has a durable, stainless steel frame and a sleek, modern design. The base of the machine has a sliding wheel base for easy rotation. 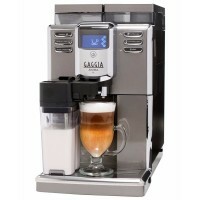 A dial, located on the front of the machine, allows you to control the Saeco Brewing System. 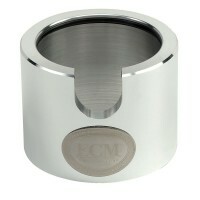 With this unique system, you can select the strength and consistency of your coffee to achieve the desired beverage. The Xelsis Evo is backed by a powerful 1500-watt heating element or robust brewing operations. In addition, this model has double boilers, one for steaming and another for hot water dispensing. This machine includes a 1 year warranty directly through Saeco and an additional limited 1 Year Extended Warranty from Whole Latte Love.